Europeans love their soup, as anyone who traveled to Eastern Europe would agree that soup in part of every lunch and dinner menu. Soups are quite simple to prepare, and very nutritious as well. You can make your own stock, as the base for every soup, or use the ready-made available at your grocer. There is such a variety of broth available….chicken, beef, vegetable, low-fat, low sodium….which makes it that much easier to cook your favorite soup anytime. 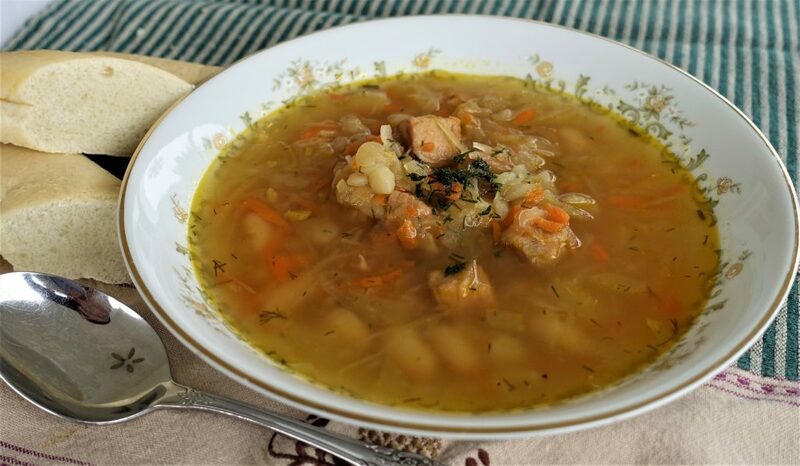 Today I will share a recipe for Ukrainian Kapusniak (Kapoosnyak), Sauerkraut Soup made with pork stock and Cannellini beans. It makes a large pot of soup, enough for a crowd, and best served hot, accompanied by a nice piece of crusty garlic bread. Delish!! Cut the pork chops into 1 inch cubes. Set aside. Add canola oil to a stock pot, and brown pork cubes to light golden color. Remove and set aside. Add onions, and saute until wilted. Add shredded carrots and celery, and saute 5 minutes. Add chopped garlic, and saute 1 minute. Mix in browned pork cubes, cubed potatoes, bay leaf, and vegetable stock. Bring to boil , lower heat, and simmer for 1.5 hours, semi-covered (I tilt my lid so some of the steam escapes). Add sauerkraut, bring back to boil, and simmer for an hour, or until the kraut and meat is cooked. Add sauerkraut brine, cannellini beans, salt and pepper to taste. If you prefer more liquid in your soup, you may add more broth or water. Remove the bay leaf, and discard. Bring to boil, and turn off the heat. Add 1 Tbs. of the chopped dill, but reserve the rest to use for garnish before serving. I love the way this recipe looks! It sounds so delicious. I have been doing my best to find some delicious soups that include sauerkraut in them, as I’ve been on a sauerkraut kick! Thank you so much for sharing, can’t wait to try this out and report back how it turned out! Thank you so much for stopping by my blog and checking out the sauerkraut soup recipe. This recipe also tastes great with vegetable broth, rather and the meat one I used this time. I would love to hear back from you with feedback on how you liked it. I have pork loin at home but no chops, do you think that’s an okay substitute? This looks really tasty I can’t wait to try it at home, thanks for sharing!